This all new Sealed Intake System produced 9hp and 14lbs. x ft. torque and outflows the factory intake by 20%. This system uses a Pro 5R progressive weave filter for maximum airflow and increased performance. 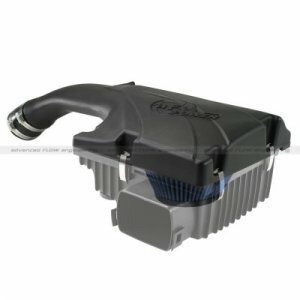 This unique sealed air intake system uses a one piece rotomolded air intake tube that snaps onto the factory lower air box for a quick hassle free installation. The lower air box retains your factory ram air scoop to keep cool air flowing for maximum power gains. This installation takes approximately 20 minutes and comes complete will all necessary hardware. 3-1/2" Tall Conical Pro 5R Air Filter: This intake utilizes a huge, 3-1/2" tall conical Pro 5R performance air filter with inverted top for increased performance. The PRO 5R air filter uses five layers of progressively finer mesh cotton gauze media to provide maximum airflow for best performance results. Washable and reusable for multiple cleaning cycles, the tall, open, evenly spaced pleats provide excellent dust holding capacity for a longer service cycle between cleanings. One-Piece Rotomolded Intake Tube: A one piece rotomolded tube is used to retain your factory lower air box. The lower air box retains your factory ram air scoop which provides constant cool air and keeps warm engine air out for maximum performance. This one-piece intake tube uses factory mounting locations for a hassle-free installation. Dyno Tested Intake Tube: The intake tube is designed to maximize air velocity and is dyno and flow tested using the latest engineering tools for maximum performance, mileage and throttle response.